In a recent case involving a company, a due diligence assessment warranted evaluation of files of certain decision-making employees to ensure that the processes were being followed. It was found that one of these employees had been 'gifted' an iPad from a vendor. Subsequent reviews indicated that this vendor was able to maintain the lowest bid on most of the contracts for the company, and thereby being awarded a significant work. Investigations revealed that the employee had been leaking pricing quoted by the vendor's competitors. In another case, after complaints were raised that employees of a company had paid bribes to certain government officials, the investigating team of the company noticed an email requesting approval for a "gift". The email further indicated that as it was a festive season, the gift would be "adequate" to ensure that a pending decision would go in company's favour. Interestingly, the email request had received an approval from the management. It is common practice to give and accept gifts during the festive season. However, companies in India have become conscious that such gifts could be construed as a bribe to influence a policy maker, or gain undue competitive advantage. Once convicted, such offences could attract imprisonment up to seven years if the bribe-taker is a public servant. A person who gives bribes to a public servant could be charged as an abettor and attract imprisonment up to six years. 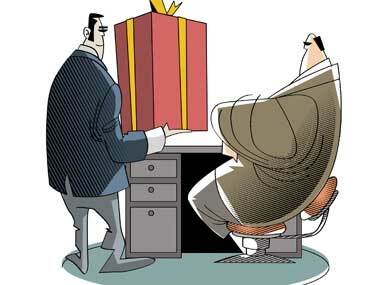 Till about five years ago, Mukul Shrivastava, partner, fraud investigation & dispute services, EY India, used to deal with barely five such engagements in a year that involved advising clients on their gifting policies. "Now, we get 30-odd requests in a year," says Shrivastava. Every six months all employees at Kroll India, a risk advisory firm, go through a periodic training programme that includes reiterating different aspects of the code of conduct for employees, including the rules for giving or taking gifts, and the company's entertainment policy. "We practise internally what we tell our clients to do," says Reshmi Khurana, managing director, Kroll India. Most companies club their gifting, hospitality and entertainment rules as part of code of conduct for employees. Multinational companies operating in India are largely covered by the UK Bribery Act and US Foreign Corrupt Practices Act. A typical gift policy lays out specific guidelines on the nature of gifts, value limits, and provides scenarios or occasions when giving or accepting gifts is permissible. They also cover the nature of documentation required, and processes followed while offering or receiving gifts. The threshold value of gifts in Indian companies range anywhere between Rs 1,000 and Rs 5,000, points out Swarnima, senior associate, Trilegal, a law firm. The Companies Act, 2013 or the Securities and Exchange Board of India listing agreement does not have rules or laws directly covering the giving or receiving of gifts. However, both the laws require companies to have adequate internal controls to identify any kind of misconduct or unethical practices. These cover improper gifts and entertainment. "All cases of non-compliance must be reported through a whistle-blowing mechanism," says Shrivastava. The most relevant laws to have a direct impact on gifts and entertainment is the Prevention of Corruption Act, 1988 (PCA). Under service conduct rules for public servants, disclosure obligation lies upon the public servant to whom the gifts are given. Legal experts point out that PCA gives a wide definition of bribes, irrespective of any amount. "Any gift with intent to obtain business favours transacted, or to be transacted, should be seen as a violation of the Act," says Lalit Kumar, partner, J Sagar Associates. As more Indian companies enter into cross-border business relationships with foreign partners, they are likely to come under the ambit of international anti-bribery laws and regulations. Given the heightened focus on legal and regulatory compliance in recent years, it might well make sense for corporate India to look at this gift horse in the mouth. Is the gift given with an intention to influence the other person? Is it for a select few or for a wider section of the people? Is there a visible logo of the company giving the gift? Is the value of the gift in line with the company policy of the side giving the gift as well as that taking it? Will I accept as a gift what I give to others?